This month we will discuss how to shoulder heavy dumbbells for incline pressing. I have found that in order to press heavy dumbbells on the incline bench, one must learn to shoulder the dumbbell relatively easily in order to conserve energy for the actual pressing of the weight. 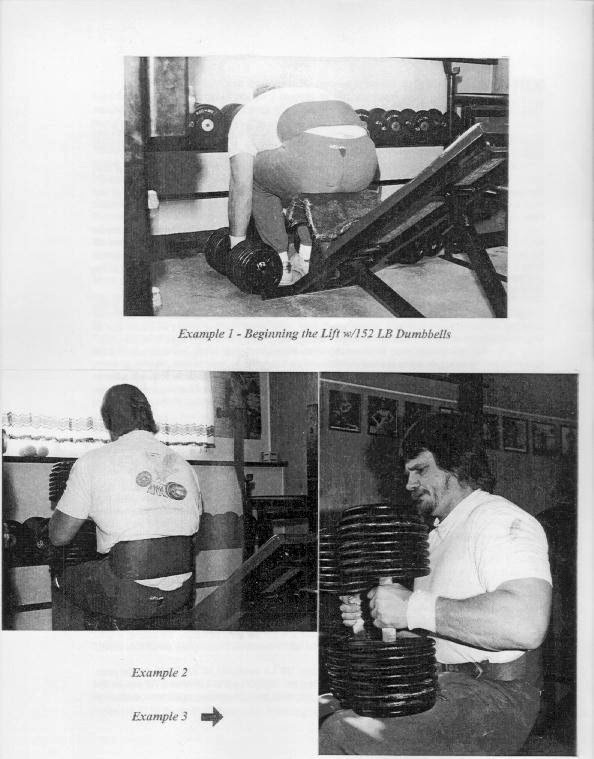 There are many popular methods used to shoulder a set of dumbbells - some working better than others. One is to clean the weights from the ground or hang, and then sit down and push the dumbbells up. The main problem with this method is that one quickly becomes limited with what one can clean. If one were to continue for any length of time with this method, one's press would quickly overshadow one's clean. The most common technique seen in most gyms today is to sit on the bench - dumbbells resting on the legs - and then kick the 'bells up one at a time. You can also get a couple of lifting partners to hand off the heavy dumbbells - this method probably being the most inefficient of all, if for no other reason than it being a sure way to make your training partners scarce when the time comes for your next set. Here again, you are limited by the strength of your partners, and the whole balancing act of handing over a bulky set of dumbbells becomes a colossal waste of time for all involved. As a sideline, something else to consider is the strength of the bench you'll be using. Is it strong enough to handle your bodyweight, plus the additional load of the dumbbells? The worst thing imaginable would be the entire bench collapsing in mid-set -- ouch!! The bench you use should be ideally able to support a minimum of 600 lbs. in the 30 - 40 degree setting; which I think is the ideal angle to incline press. Another item to think about is the stability of the bench. Will it tilt or fall over once you kick the dumbbells up? Every gym seems to have a different style bench for inclines, so learn how your bench behaves before attempting heavy dumbbell work. If you skip ahead to the photo sequence, you will notice in Ex. 1 how my bench is constructed - the seat angle moves upward as the angle of the bench decreases, so that when the dumbbells are lifted on the legs, I am actually sitting on the edge of the seat perfectly balanced. difficult part of the procedure. It is also important to pull hard with the hands (like a seated clean), in order to make the movement as fast as possible. Not unlike a real clean, the faster you get the bells into position, the easier the remainder of the lift. Once the dumbbells arrive at the shoulder (Ex. 5), the palms should be turned facing forward (Ex. 6), and at that time, the pressing can begin (Ex. 7) and the lift can be completed. When replacing the dumbbells, the sequence simply needs to be reversed. This method of cleaning dumbbells does take a certain amount of practice, but is a very natural movement once you get the hang of things. Of course, it goes without saying that you should master the technique with lighter dumbbells before going ahead with heavier training. 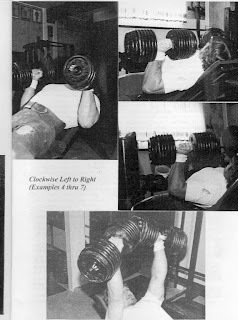 By using this method, I was able to bring up two 170 LB dumbbells (at 216 BWT) for the press. My best complete incline press with dumbbells was a two rep lift with two 152 pounders. Of course, this was before my shoulder surgery, but I guarantee once you really learn this method you'll never go back to anything else. Happy Training!! !